Caretaker chief Dom Genovese is convinced his young talent can continue to shine bright for Northern Star. Genovese has handed first-team opportunities to several homegrown prospects since taking temporary control alongside former Huntingdon manager Seb Hayes in February. 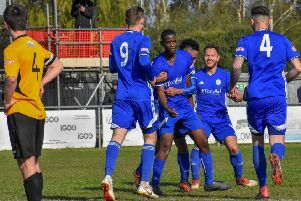 No-one has made a bigger impact than 17 year-old hot-shot James Hill Seekings who climbed off the bench to fire his third goal in his last five first-team appearances to complete a come-from-behind 2-1 United Counties Premier Division success at Sileby last Saturday. Another teenage talent, Jordan MacLeod, had earlier levelled. Genovese said: “We don’t have the financial muscle to compete with a lot of clubs around here and that’s not the route we want to go down anyway. “We have a scholarship system in place and it is vital we bring those lads into senior football. Last Saturday is a great example of what can be achieved. Hill-Seekings also scored for Whittlesey Reds last Friday in the Peterborough Youth League Under 18 Cup Final.